It's been nearly three years since former "Grey’s Anatomy" and "Private Practice" star Kate Walsh had to face her own health scare. The actress told Cosmopolitan magazine last year that she had a benign tumor in her brain removed in 2015. Now Walsh, 50, is prioritizing herself and encouraging other women to prioritize their health. "You can never talk too much about how important it is for women to be proactive about their health," she told ABC News. Kate Walsh and actor Elisabeth Rohm pose backstage at the American Heart Association's Go Red For Women Red Dress Collection 2018 presented by Macy's at Hammerstein Ballroom, Feb. 8, 2018 in New York City. She was one of the many women -- along with Melissa Joan Hart, Tatyana Ali, and "The Bachelorette" star Rachel Lindsay -- to walk the catwalk at this year's Go Red for Women Red Dress Collection. 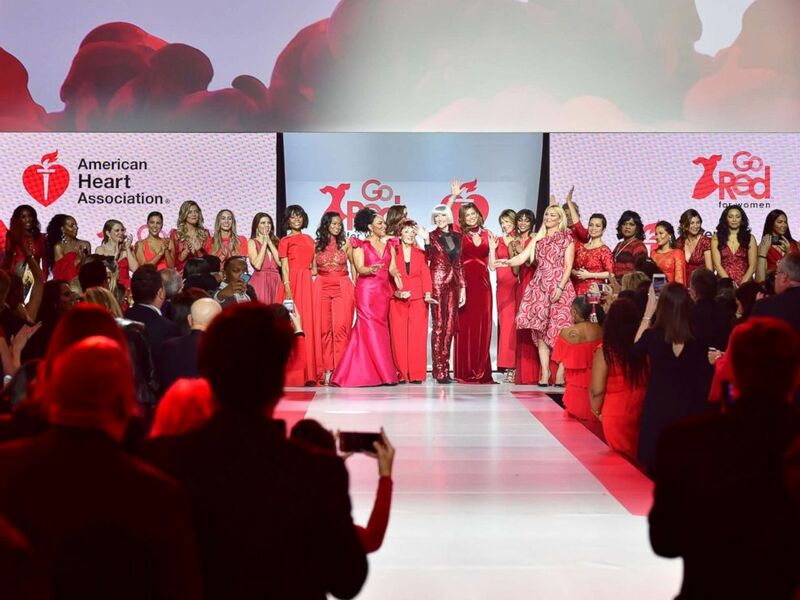 Held Thursday night inside New York City's Hammerstein Ballroom, the American Heart Association's fashion show, which helps raise awareness for how heart disease affects women, kicked off New York Fashion Week. A view of the runway during the American Heart Association's Go Red For Women Red Dress Collection 2018 presented by Macy's class photo at Hammerstein Ballroom, Feb. 8, 2018 in New York City. Walsh said that now her trick to self-care involves lots and lots of water. "I walk around with this giant water bottle," the actress said. "It's a half-gallon. So if I make it through one of these a day, I'm doing great." Walsh added that her water at times includes apple cider vinegar, lemons and astragalus root, which is considered by some to be an anti-aging and stress-reducing herb. Rachel Lindsay (L) and Actor Melissa Joan Hart prepares backstage at the American Heart Association's Go Red For Women Red Dress Collection 2018 presented by Macy's at Hammerstein Ballroom, Feb. 8, 2018 in New York City. "I'm always keeping inflammation low," she explained of her additions. Along with keeping a diet high in good fats and protein -- "tons of veggies," she said -- Walsh loves walking. In fact, it's one of the reasons why she moved back to New York, she said. But just because she's focused on her health doesn't mean she doesn't splurge sometimes. "I'm not going to stay away from my potato chips and by the way I love regular Doritos," she gushed. "I like the orange powder."